America’s best AQ-4100 shower filter, with Centaur Carbon technology and adapter for Chinese municipal water systems. Awarded Consumers Digest Best 2006-2008. Includes adapter for Chinese shower systems. Works with your existing handheld shower wand, or Aquasana massaging shower wand also available. Showering in warm water opens the pores of the skin and allows a high rate of absorption of chlorine and other chemicals. In fact, the steam we inhale while showering can contain up to 30 times the level of chlorine and other synthetic chemicals than tap water. This is because these toxic chemicals found in tap water vaporize at lower temperatures and at a much faster rate than water. A recent report in the American Journal of Public Health linked chlorine to significant increases in certain types of cancer and stated that “up to 2/3 of the harmful exposure was due to skin absorption and inhalation while showering”. Inhalation of chlorine and chemical vapors is known to be a strong irritant to the tissues in our lungs and is suspected to be a leading cause of asthma and bronchitis. When chemicals are inhaled into our lungs, they enter directly into our bloodstream and the adverse effects are magnified, compared to ingested chemicals which are partially filtered out by the liver and kidneys. Without the effects of chlorine and other chemicals found in tap water, your skin and hair retain moisture more effectively for a younger, healthier look and feel. The Aquasana Shower Filter is one of the best products for beautifying skin and hair and offers tremendous benefits to people with skin conditions and breathing disorders. It is one of the only shower filters to deal with VOCs, THMs, and other extremely toxic chemicals. It installs in seconds without tools, and provides healthy filtered water for showering. The chlorine and chemicals in China’s municipal water supplies are meant to disinfect the water. But anyone who has been in a chlorinated pool knows that chlorine strips the body of its natural protective oils, leaving skin and hair dry and irritated. What many people don’t know is that tap water often has as much or more chlorine than most pools! Daily exposure to hot chlorinated water causes long-term damage to skin and hair, and accelerates the signs of aging. Instead of trying to fight it with expensive lotions and conditioners, remove the problems at their source. Aquasana’s unique two-stage filter process provides the healthiest shower possible, with guaranteed results within a week. The water feels wonderful on your skin and the deluxe “Niagara” adjustable pressure shower head prevents any pressure loss while saving water. Also important: healthy minerals are retained and the water is pH normalized to an optimal balance as found in nature. Most people are not familiar with these groups of chemicals. However there has been a strong link for many years between these chemicals and serious diseases including of adult and childhood cancers, hormone diseases, asthma, allergies, eczema, psoriasis, and other autoimmune diseases. Pregnant women exposed to these chemicals have a much higher risk of miscarriage, low fetal weight babies, birth defects, infant cancers and hormonal syndromes. Many of these chemicals are slow to leave the body, building up until detectable in the body’s tissues, blood, and breast milk. While the EU has banned many of these chemicals, China closely follows the U.S. EPA’s limits on maximum permissible levels. However, these chemicals can still be commonly found in China’s water supplies. Studies show that absorption of these chemicals is 17 times higher through showering than direct consumption. An average person will absorb more THMs during inhalation in a 10 minute shower than by drinking 4 liters of unfiltered water. The Aquasana Shower Filter is the best way to protect yourself and your family from the immediate and proven long-term dangers of these chemicals. Do not use a shower filter that doesn’t remove VOCs, THMs, and other disease causing chemicals! Maximum operating temperature of 46 degrees C, high above normal shower temperature of 38 to 40 degrees. The Aquasana Shower Filter has a unique two-stage filter process for the healthiest shower possible. 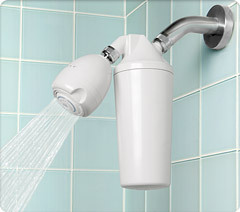 The shower head’s unique design prevents any pressure loss, while using as little as 6.6 liters per minute (1.75 gallons per minute) – saving up to 41,640 liters per year (11,000 gallons per year) of hot water. Stage 1 Natural KDF Copper/Zinc mineral media: removes chlorines, heavy metals, microorganisms, scale, and enhances pH balance. Many shower filters claim to use reduce chlorine, but the Aquasana system uses the highest quality KDF filtration media and at a higher quantity than any other filter on the market. Non-toxic 100% recyclable technology – no chemical additives. Stage 2 Centaur Carbon medium for the removal of synthetic chemicals, chlorine and chloramines, THMs and VOCs that vaporize from tap water and are inhaled or quickly absorbed through the skin. The shower filter installs in seconds without tools. Refill cartridges are recommended every 6 depending on the water quality and usage. Pressure Loss: None to minimal. If you notice more than a 10% drop in water pressure, you may have an aerator valve in your plumbing fixture that needs to be removed. This only takes a second, please contact us for details.